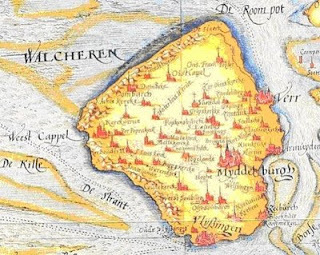 Regarding the shrine of Nehalennia on the Island of Walcheren. The passage brings to mind the placement of temples and shrines in a World. In this case, to world weave this a bit, the temple is placed on the location where travelers will disembark on a long and perilous sea journey to another land. The ancient goddess is usually invoked with prayers before the travelers disembark. Her Shrine is possibly overlooking the sea from the top of one of the hills. After the ceremony or prayer the travelers walk down the well worn dirt pathway to the port and board the ship, spiritually prepared for the far journey, and hopefully protected from doom upon the sea, having left some gift at the alter. Thus the temple was placed at a location where it had direct usage related to the duty or domain of the deity, which is in Nehalennia’s case was to protect travelers, especially sea faring ones. A Teutonic goddess, probably of navigation, commerce, and fertility. She was locally worshipped in the area of Domburg (Walcheren), where a temple of her was discovered. She is represented in a sitting position, or standing with one foot on the bow of a ship. Her attributes are a basket with fruits and a dog. She is associated with the Belgae, Frisians, and Morini. Based on this I think it interesting to consider that Shrines and Temples may have special considerations in terms of placement. It may not be merely that they belong on the heights of some convenient acropolis, but that they may belong wherever they are most fitting according to their function. If we were to consider some World Weaving guidelines I would say that the placement, as in the case of the temple at Walcheren, would be toward a specific purpose so that the people who do homage to the deity do so at that location for actual some reason. Another example might be the temple of war, located in the direction of a pass through the mountains over which the Warrior Army most often marches to wage war on their enemies. As they approach the pass they stop at a hill upon which the temple sits in order to pray for victory before departure on their desperate venture, and stop again and give thanks and sacrifices (or otherwise) upon their return. Another example might be the temple of the goddess of the Earth which might be located at the entrance of a cave into which votives enter for rituals related to the fertility of the womb, leaving perhaps some small treasure as an offering on a stalagmite, and after which they get married in the temple. Consider these examples as World Weaving exercises that illustrate what I mean. It is this sort of consideration that may help in the placement of Temples and Shrines in a World. I would not over do it by making it a rigid rule that demands that every Temple and Shrine must conform to this pattern as then it might become too burdensome and obvious. 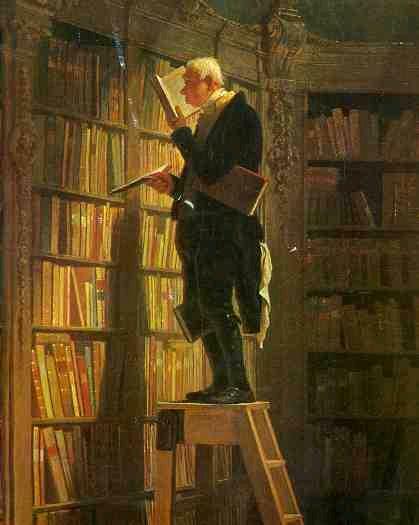 Yet, done in the right proportion it could lend a certain beauty and depth to a world, which would not be easily discerned, and yet would be ever present via the placement of these sacred architectures. Dark wet places such as caves, or within bodies of water such as lakes. Green and black spotted floating tube-like creature with 7 long tendrils at one end, and a beak-like mouth. The tendrils end in sharp points, and are used for movement, and grabbing / stabbing prey with poison barb. These non-intelligent creatures are voracious eaters of flesh, with a preference for mammals. They usually move in groups of 4 to 20. The tips of their tendrils have a poison that causes paralysis on critical hits, and they can attack four times per melee. They are very agile in the air or water and can float up to 2000 feet in the air, and dive as deep as 1000 feet in water. So without further ado, here is my list of recommended readings for my fellow Gamesmasters. Best wishes on magnificent Worlds! Use Google Docs Drawing for White Boarding - Some experimentation shows that you can import images, such as a gaming map to White Board and create icons to move around. You can share the Drawing with your friends, and that should be good enough as a game board. Conversely, there are applications such as Map Tools that can be used for the same purpose. Use Yahoo groups for between-game communication, scheduling, and file storage. Conversely there is Obsidian Portal which is reported to be quite good for helping to maintain game info. OOC in parens in the main channel is ok. That is, it turns out, probably less confusing than created a separate OOC channel for Out Of Character conversation (which is one of the things I tried before). Feel free to say, "Ok, guys, I'm a bit overloaded, can you slow down a sec and let me think?" Make use of Private Messaging to give players info only their Characters would know, but keep PMing to a minimum to help keep players engaged. Realize that IRC is slower than in person play. You can solicit for Players in IRC Channels related to RPGing. A list of such networks and channels would be nice. All of this seems like good advice. I'm wondering if anyone else has advice, and/or better yet a website that gives a good old run down on how to get up to speed on this in the right way. Something along the lines of "IRC RPGing For Morons" would be great. The questions I'm looking for opinions on are: What are the best cheap/free tools for IRC RPGing? How and where to solicit IRC RPG Players? How to maintain a long term campaign? How to handle Player Character absences? And any other advice anyone cares to offer. What aspect of Pencil & Paper RPGs is intrinsically superior to Computer RPGs? One word: Creativity. As a Player, I can only do what the computer programmers and level designers come up with for me to do. Even if it's a million things, the fact is, I as the Player can not "invent" any of them. I can only select from the list of things that someone else invented for me to do. As a Gamesmaster, I can create my World with the infinite variety and complexity that pleases my artistic sense. But in a Computer RPG I can not do that. I can only go along for the ride as a Player. I can not do any of the cool things that Gamesmasters can do in their own Worlds. Of course there have been some pretty good games that allow people to create their own Levels of Dungeons, and Gamesmaster to a certain degree. But I think that even the best of these are left in the dust by a Pencil & Paper RPG, which has no limitations to what can be invented, since there are no constraints other than limits of human imagination. So for creativity I go with Pencil & Paper RPGs. That said, what Computer RPGs give us is immediacy. I can hop on to a game instantly. No scheduling with friends required. I can run around in artistically beautiful looking Worlds. I can run around and gain points and level up and brag to my friends. I can even, if I want to, schedule time with my friends to meet them online and play with them. So for instant gratification, and eye candy, nothing beats the Computer RPG. Which is better? Well, that depends on what you're really interested in. But one thing is certain... despite the similarity in names, Computer RPGs are a very different animal than Pencil & Paper RPGs. And for me, Pencil & Paper RPGs win hands down, every time. I'm working on incorporating the Elthos Tarot into the Campaign Setting over time. That involves in some ways creating stories that will draw the Tarot Deck into play. Zatok is an old name that goes back a long ways in Elthos. And the mountain has retained that name, even beyond the vast span of time that separates the two civilizations of that place. Some ask how it is that the new comers would have named it after it's old name, and how they might have discovered that name. Some few guess that there must be some remnant from the olden time, someone who knows the ancient names. Indeed there may well be some such lurking about in the shadows beneath the township on the hill, perhaps. There are rumors, hardly believed, of a race of olden times living in caverns far beneath the surface world, deep within Zatok Mountain. Few from the town venture forth into the wilderness below the plateau on which the town was built. Seldom do such as go on hunting expeditions into the forests come back without some blood soaked tail to go with it, half of which are scarcely to be believed. The boldest tale of late has been that some hunting party returned with but one of its members still living, though gravely wounded was he. He told an impossible story of deep forest terror, where his party was picked off one by one, and of a "great cave bear made of iron". And then he died of his injuries. Most folk don't believe the tale, but then they wonder anyway, and no one ventures toward that area of the forest these days, if they dare go outside at all. Some things, the townsfolk believe, are just best left alone. And besides, hunting and gathering are hard work, and not well enough paid as it is. Though truth be told, hunters who return with meat get rewarded handsomely with wealth and fame. There are also rumors, even less to be believed, of caves in the mountain that are occupied by the fair folk, or demons, or even dragons some say. 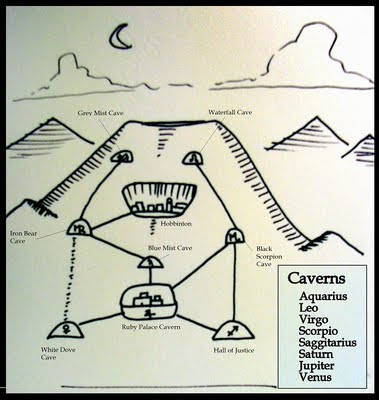 The most well known of these alleged caves is The Grey Mist Cave, in which everyone "knows" there lives a cohort of demons, or goblins, or some such. The superstitious of the town can be seen throwing bread over the edge of the town wall into the forest below, hoping the assuage the menace that might lurk in the Grey Mist Cave. Most folk, sensible folk, think the whole of idea of monsters living in caves on the mountain absurd. But don't ask them to go on an expedition to explore any caves on the mountain that can be found, because they'll be disinclined to join you. One mighty beer swiller in the Rat's Den Pub claimed once that there are even caverns beneath the town, and each one is magically enhanced in some way, and are mystically linked by secret undercurrents of correspondence to the Celestial Elkron. However, most sensible folk in town have no interest in such stories, and take no time to consider what the implications might be were such a thing true. So the mighty swiller sat until the wee hours over his mug and took to brooding. And while he brooded, into the wooden board of the table he carved the above map of the Caves of Zatok Mountain. How he may have come by such an idea, no one knew, except it be that they heard him mumble to himself on occasion that he'd heard the tale from a crazed monk living out in the wild on Zatok Mountain. When he saw the engraving on the table the bartender nodded and remarked to himself that his old friend the poor swiller had lost his marbles some time ago, and there was simply no easy way for him to find them again. With a shrug and an indifferent tone he asked payment for the beers, received the exact amount, and went back to tending his other customers. Later someone actually cut the table plank off with a saw, and made off with the map, for some reason. But the bartender had made a rubbing of it before hand, and he kept a copy, just in case it turned out to be valuable after all. The idea of this adventure is to introduce various potential links to the Elthos Tarot, and the Ekron, and the myriad of their corresponding manifestations, with an eye towards considering the current ideas for it's use, and exploring possibilities for additional uses. First off, the Elthos Universe has got Mr. BadAss Bunny as it's Mascot, so that's hard to beat. Second, I would say that the adventures that come out of Elthos are pretty badass as well. 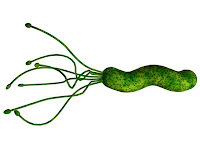 I try to GM concepts that I think will surprise my players, and in some of the more recent cases the most badass thing they did was shrink down to the half the size of rice-grains in order to escape an enemy, riding on the backs of aphids. with the help of Biddy Mable, who happen to be watching over them from afar. She brought them into Weeleena's Tea House (an interdimensional tea house that fey like to visit). To escape they climbed the Shrinking Stairs, and found themselves half the size of a grain of rice, and were escorted by two Princes of the Aphid people, upon whose backs they rode to discover the Aphid Temple inside a stone on the western parapet wall, and communed with the Holy Aphid there (an old man). As it turns out the Insect Kingdom is ruled by a mysterious Insect King (whom they never saw, but had a big influence from afar). Despite having a King, however, the world of the Insects is fraught with faction and continuous warfare. The Locust Ambassador arrived. He was a large bulky half-man/half-Locust, redish in color, and plated with magical copper armor. He demanded that the Aphids support their claim to the King that the Ants stole their food and must deliver it, ALL of it, to the Locusts, or they would rise the Grand United Army and destroy all the green things of the valley. This of course included the Player Character's home town. They got busy. First they decided to capture the Locust Ambassador (they were not big on diplomacy), and haul him in front of the towns folk so that they could see there was a real threat coming, and so help them to build a huge bonfire on Mount Zin in which they hoped to focus the Locust Swarm and destroy it. The focusing would be done by praying to the appropriate Elkron at the right time to funnel the winds in such a way as to drive the Locusts into the blazing mountain grotto. This plan was executed, the Red Locust Ambassador captured, with the help of Lady Isabella, a LadyBug Princess who took an interest in one of the Player Characters named Storm Wizard (aka, John Bellowick), and her body guard, Captain Ferdinando the Wasp Warrior. Unfortunately, what they didn't know was that the ferocious and barely containable Red Locust Ambassador did not come alone. His brother was nearby watching with a Squadron of Hypnotic Crimson Mosquito Fighters (think Air Force), and Water Bugs (think Artillery), not to mention the Silver Locust Ambassador who himself was another formidable opponent. An epic war broke out between the Locust forces and those of the King, who had taken umbrage at the audacity of the Locusts and sent two Ant Armies to rectify the situation and capture the errant Locusts. During the battle the tiny sized adventurer's found a tunnel under rock that lead into a spider cave, which was actually the entrance to the Temple of the Spiders, and nearly got lost in the Illusions and trapped the 'Web of Lies' therein. Nevertheless they escaped and as they fled on the back of a lady bug into the distance they watched the last moments of the battle from the air wherein the Locusts were finally captured by the Ants and their Wasp Warriors (the other Air Force). Needless to say, it was exciting. And that is to leave out quite a bit of detail about how Juliette Bellowick died, and was able to rescue Pamela McFearson from Limbo, and managed herself to be seduced by the Dark Scorpion Prince of the Underworld, and escaping there arrived safely at the Monastery where the Abbess had performed many a life-summoning ritual. By the end of the story (and leaving out lots of details) the Party made it safely home to their anxious father and ailing mother, and so ended that Chapter of the Campaign. Oh, needless to say, the black seed that Juliette had planted in a flower pot grew into a peculiar and monsterous plant-man the size of her thumb which sprang out of a hairy black bulb on the top of the plant. The bottom of the plant was a long stringy vine that overflowed down the side of the pot, down to the floor boards and vanished below the barn. They tried cutting the vine but that, as it turned out, was not as easy to do as they had hoped. The vine, as it happens, was what old mama Bellowick tripped on when she banged her head and fell ill, soon after the Bellowick children disappeared off into the sunset on their adventure. Fortunately, when they finally got home, they were able to call upon the friends they made along the way to bring mom healing soup, and so everything turned out well. Overall, it was pretty damn BadAss. I wrote up the entire story in prose with all of the actual dialog and detail and maps on my Blog. You can find the whole "Actual Play" Story write up in Chapters here, which is another BadAss expression of Elthos. And then of course there was the incorporation along the way of the Elthos Tarot Deck, another bit of BadAssery that I created with the amazing artistic assistance of Jason Moser, by which Morgana foretold the Death of Mr Montague, though in the end it saddened her greatly. Lastly, the final BadAss aspect of Elthos are the "One Die System" (ODS) Rules which is a Mini-System I created for the Literary Role Playing Game Society of Westchester so we could try out GMing ideas at the local pub where we have our meetings. The Elthos ODS has turned out to be a pretty handy little system, that as it turns out is simple enough, yet complete enough, to run a reasonably light weight Traditionalist, non-Genre-Specific game. It also has the virtue of being programmable due to is simple mechanics. So I created one more BadAss thing - the Elthos ODS Web Application that runs all of the ODS Rules as a web based Application. 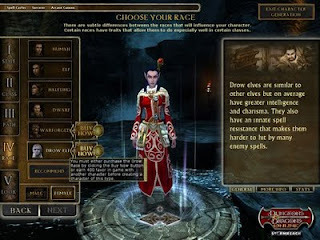 It allows GMs to create their own Worlds, roll and manage Characters, equip them, and maintain records of their adventures, doing all necessary calculations. Basically a Gamesmaster's Toolbox, and World Weaver's Development Studio. Ok, that is all the BadAss I have (except also for my Elthos Drawings!). But gosh, that's enough already! Sheesh!! And finally, a warm and hearty "Thank You, kindly" to our RPG Carnival Host at Nevermet Press! 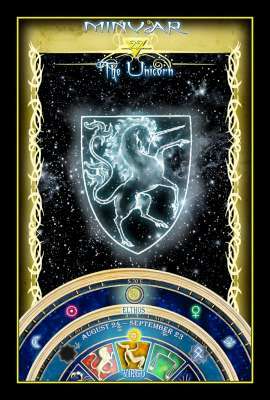 This is the final version of the Celestial Island Map back-face card for the Elthos RPG Tarot Deck. I can not begin to tell you how thrilled I am at how nicely the deck came out. Thank you Jason Moser for a really incredible job on the artwork for the deck! 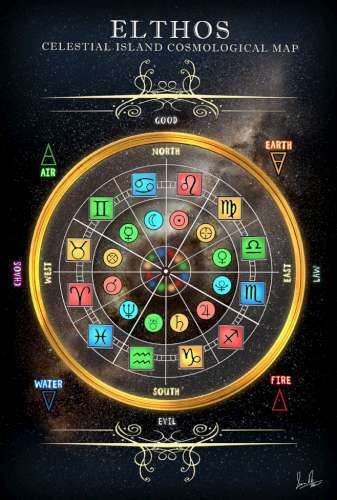 The Celestial Island Map shows the relationships between the various Elkron of Elthos (the Celestial Deities, or Greater Powers, or Inner World Beings, Archetypes, etc). There are 12 Constellations (the Outer Circle) that correspond to the Titans, who were overthrown by their children, the Young Elkron, who correspond to the Olympians (the Inner Circle), in the Wars of the Elkron at the dawn of the 2nd Age. 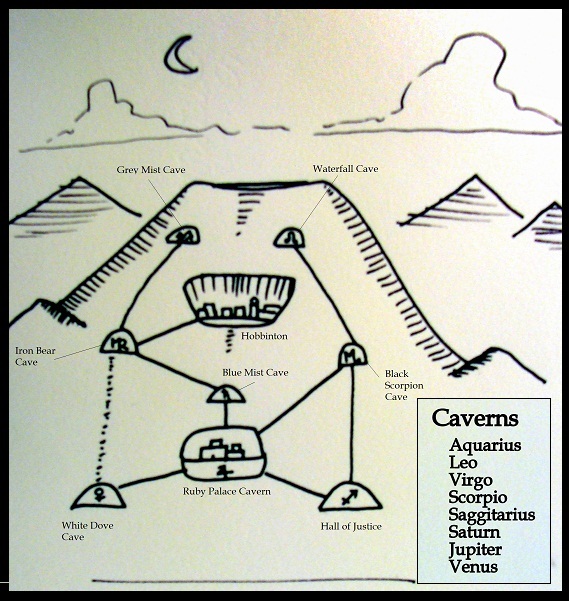 This Map also shows the Alignment pattern, as well as the Elemental configuration upon which the Elkron have built the Elthos Universe. While it may look reasonably obvious at first glance, it actually took quite a bit of research and reflection to come up with the final configuration of the Celestial Map. I hope that it will prove suitable over time, and thus far it has panned out quite well for me. In case you're wondering, I use the Celestial Map, with it's Elkronic Correspondences (a separate table in which I relate a large variety of objects such as trees, minerals, metals, colors, animals, etc., to the various Elkron), to help me guide and maintain the Inner World Landscape of Elthos. It is an amazing resource in so far as I no longer get lost among the Deities and their correspondences, and now everything in relation to the Elkron retains a consistency and meaningfulness that helps to give Elthos a more reliable, and comprehensible metaphysics. It also allows me to perform a number of Gamesmastering operations that relate to things in my World such as the relative power levels of the Elkron at any given time, prophesies, omens, and the like. While I am still in the process of creating new uses for the Elthos Tarot, I have settled on a few that so far have made my GMing life a lot nicer. Now, when the Player Characters see a Golden Eagle flying North West, it actually does have a meaning. And that meaning actually does make sense within the context of the metaphysics of the World. At some point I will be writing up a book on the Elthos Tarot Deck, and it's uses in the context of the Elthos World. But in the meantime, I just wanted to share the Back-Face card because it just came in today and I think it really does look fabulous! Thanks again to Jason for a truly wonderful job! 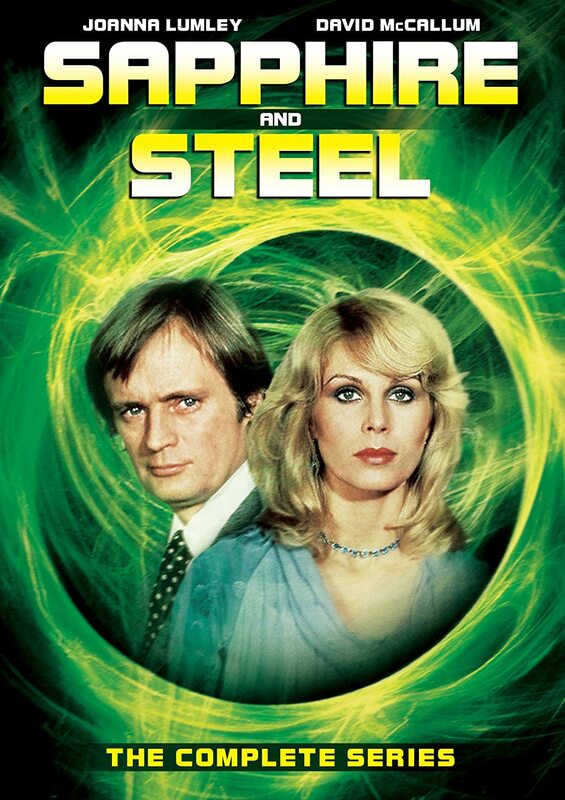 I ran across a post called "The Time of the Metalanterns" which talked about Sapphire & Steel, (thank you, GreyWulf!) which reminded me that I absolutely love that series and wanted to borrow some of the ideas from it for my World. In case you don't know, it was a British Science Fiction TV series that I think of as a cross between 'Doctor Who' and 'Dark Shadows'. It never failed to give me the creeps, while wigging out my mind with incredibly awesome science fiction concepts. The outlines of my adaptation (or borrowing as the case may be) is that there are super-sentient beings in the Elthos Universe, and a host of inter-dimensional creatures / monsters that are scarcely comprehended by mankind. One of these beings is Time. Most beings live within time, but do not understand that it is a sentient force that lives off of the life energy of those within it by devouring them in bizarre and often hideous ways, often by trapping them in the folds of time and strangulating them metaphysically. When it does this it often causes rifts in the space-time continuum. There is a shadowy Order of Time Keepers whose task it is to repair the rifts, and rescue those who may be caught in Time's traps before they are devoured. Edit: Another aspect that I glean from S&S is that Time will tend to be attracted to beings who are fixated in some way on Time, or an object that has deep significance to Time. 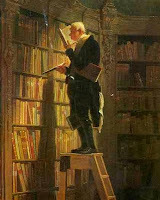 Some examples are: 1) a Scientist who invented a Time Machine, 2) the Oldest Photograph in the world, 3) a Race from the Future who wanted to transport a Monster they accidentally created into another time to escape its Civilization destroying wrath, 4) a ghost who refused to leave the hotel where she was killed by clinging to a Grandfather clock, etc. As it happens Time will devour every living thing eventually, and if you consider that life spans typically do not last very long in big scheme of things, Time can be seen as a ravenous monster indeed. 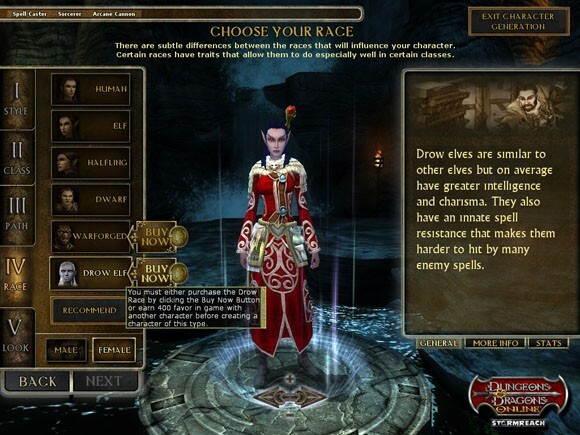 On the other hand, some races live very long lives, and so have found ways to evade Time's traps. As such the vast majority of Time's conquests are quite normal, and really amount to dying of Old Age, which everyone takes as natural. However, mankind in Elthos was not intended to be a mortal race originally, but through the original deception in Eden, Time gained a foothold on the race of men, and so every person is doomed to die, at some point in Time. 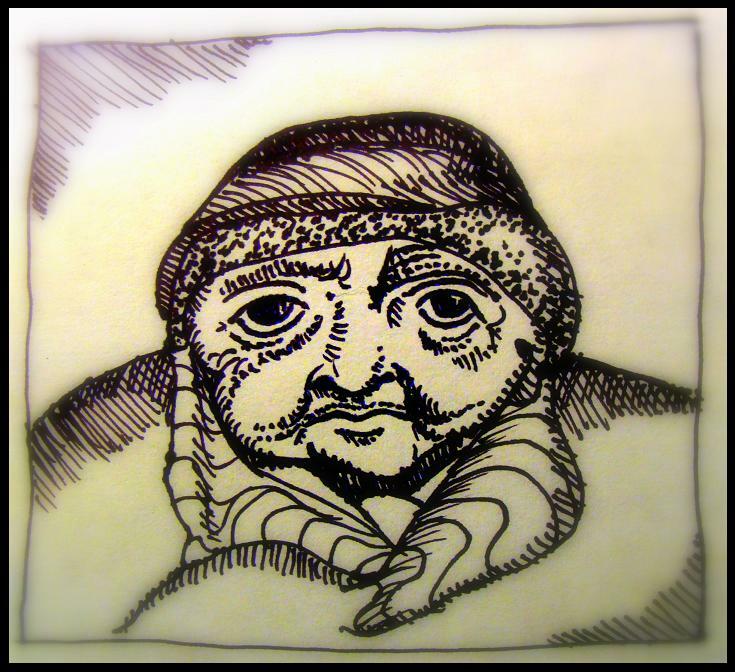 And thus, the Time Keepers know that even natural deaths of Old Age are really the Serpent Time devouring its victims. However, dying of Old Age does not cause any temporal rifts, and so the Time Keepers do not involve themselves typically with Old Age deaths at all. That is just beyond the scope of their duties. Along with Time, there are other forces and entities that are aware of how Time operates, and are able to either manipulate Time in order to advance their own agendas, or have malevolent objectives which entail the destruction of sectors of the Universe by the twisting of Time in ways that cause all kinds of havoc in the ordinary world. An example of some of these beings would include a race of beings that pinch time causing it to fold it's coils, which they use to escape dangerous situations, and which usually leaves mind boggling havoc behind them as time retaliates in the local area. Another example are Time Spies, a race of beings who use the coils of time to spy on the events taking place in past and future, and report back to their shadowy order. These beings work in conjunction with the Time Keepers. The Time Keepers function like The Time Lords of 'Doctor Who', but since I don't use that Universe, I renamed them Time Keepers, and have them operate similarly to the Time Lords, but with significant alterations as to their methods and goals. Essentially they are Time Tamers, whose purpose it is to keep Time flowing forward, and without injury to the many countless beings within it. Other large scale beings include things like Gravity, another sentient being, as well as Space, a being so horrific as to eliminate the minds of those who perceive it, and Judgement, the Ultimate Knower of the Universe. These gigantic Metaphysical entities will hardly ever come into actual play in my world, I'm sure. However, the concept that they exist, and that Time in particular is a kind of wrathful and hungry serpent, will lead to a certain segment of adventures which will involve Time, and the Time Keepers. While I don't actually anticipate running a Time Adventure anytime soon, it is still very interesting, and something that I will jot down Campaign notes on, and create a few adventures for anyway. It's just too fun a concept not to salt my world with.